Muslim women‪ are the first to pay the price for Islamophobia in Europe. That was the finding of the first European research report to be conducted on discrimination against Muslim women by the European Network Against Racism, launched in Brussels last week. The report, which covers eight European countries, focused on discrimination in access to employment, education and hate crime. It found that Muslim women face a “triple penalty” – suffering the same gender discrimination as other women, compounded by racial and religious discrimination on account of their background, skin colour and faith. These forms of discrimination intersect in complex ways – for example, in the United Kingdom, 1 in 30 white women said they had been illegally asked whether they planned to get married or have children, compared to 1 in eight Pakistani women – i.e. nearly four times more. One in four employers in the UK also admit that they would be hesitant to hire Muslim women on the basis of cultural stereotypes, due to concerns that childcare would be an issue for them. Then, of course, there are the even higher levels of prejudice against Muslim women who wear the headscarf. Despite legal prohibitions against discrimination on the basis of religion or belief in employment, Muslim women are being regularly excluded from career opportunities across Europe. Forty four percent of Belgian employers state that wearing a headscarf can negatively influence the selection of candidates. In France, tests show that female applicants with a French sounding name and female applicants with an Arabic sounding name wearing the headscarf had a 71-point difference in positive responses for an interview. For those who are lucky enough to secure a job despite the odds, many face discrimination once they are in the workplace including harassment, insults, discriminatory remarks, lack of career progression or dismissal. When Muslim women face discriminatory remarks, the reaction of employers is often to pressure, dismiss or penalise them, rather than stand with their employees. A pending French case at the European Court of Justice is a case in point – a design engineer was dismissed after a customer complained about her headscarf, which “embarrassed” the company. Rather than supporting the employee, the employer demanded that she observe the principle of “neutrality” with regards to her dress when dealing with clients – although this principle has no legal basis in the private sector. When the employee refused, she was dismissed. For those women who choose to challenge discrimination in the courts, the chances of success are pretty slim. While a strong legislative framework prohibiting discrimination in employment theoretically exists, companies and governments are using vague exceptions to justify discrimination against Muslim women. In France and increasingly Belgium and Germany, states are using a particular interpretation of “secularism” or “neutrality” to exclude Muslim women wearing the headscarf from a whole swathe of public sector jobs. “Neutrality” and “secularism”, concepts originally intended to ensure states treat individuals equally, are being interpreted in ways that directly result in discrimination against individuals of different religions or beliefs. Once “neutrality” and secularism are used by states to ban religious symbols in the public sector, they often begin to seep into the private sector. By imposing a discriminatory interpretation of these principles, the state thus opens the way for private employers to use the same language to justify discrimination across the board. This leaves the large numbers of Muslim women wearing the headscarf who graduate each year from French universities facing a brick wall of exclusion and rejection. When it comes to job prospects, Muslim women certainly do not enjoy the benefits of “liberté, égalité et fraternité”. To cope with such discrimination, the report shows how Muslim women are developing a number of survival strategies. Some try to adapt themselves to employers’ discriminatory practices (“avoidance strategy”), requesting to be put in the back office to avoid customer contact, so as to keep their jobs while satisfying their bosses’ wishes for them to be invisible. Some are faced with the difficult choice between their personal convictions and their aspirations, and choose to remove the headscarf. Another strategy is to “opt out”, turning either to entrepreneurship and self-employment (a rising phenomenon in France), or give up on a career, leading to frustration and isolation. Particularly disappointing is the position adopted by the European Court of Human Rights – as one legal expert commented at the report launch, the court has never upheld a Muslim woman’s right to wear a headscarf in education or employment. After years of legal struggle, women who have brought claims in the court have been denied their religious freedoms based on various grounds – public safety, ‘established social norms’, secularism, protecting the rights of others, or gender equality. The most powerful regional court in the world, charged with upholding the ideals of a democratic and pluralistic society, has repeatedly upheld bans on the headscarf based on government assertions about Islam and Muslim women, and mere stereotypes unsupported by evidence. By doing so, it is sending a clear message that Muslim women’s right to practice their faith has no place in European society and that, in order to “liberate” Muslim women, we must restrict their choices. The most significant finding of the report is that Islamophobia is a specifically gendered form of discrimination. It does not affect men and women in the same way – Muslim women are far more likely to be the victims of hate crime and speech than Muslim men, especially if they wear a headscarf. They are the primary targets of threats, hate speech, violence, assaults and online hate. In the Netherlands, over 90 percent of the victims of Islamophobic incidents reported to the organisation Meld Islamofobie in 2015 were Muslim women. In France, 81.5 percent of Islamophobic violence recorded by the Collective Against Islamophobia in France in 2014 targeted women, most of them wearing a visible religious symbol. The statistics put forward in the report represent only the tip of the iceberg – as a 2009 survey by the EU’s Agency for Fundamental Rights found, 79 percent of Muslim respondents did not report their most recent experience of discrimination to any competent organisation and an average 80 percent of respondents could not name any anti-discrimination organisation that could offer support or advice to people who experience discrimination. Despite the clear rise in Islamophobic attacks documented by NGOs, most EU states do not register the religious affiliation of victims or disaggregate statistical data along religious lines. Without official statistics on the scale of the problem, it becomes easy to ignore it. For Islamophobes, and for wider society, Muslim women (especially those who are visibly identifiable) are “boundary markers”, their dress not seen as a matter of personal choice, but as fodder for public debate, invested with meanings and prejudices imposed by society, by media representations and political exploitation. While the public debates about Muslim women that flare up periodically in Europe are allegedly about their autonomy and liberation, they are often the last to be consulted. This report, for the first time, puts them centre stage and seeks to understand their experiences and realities. It is time for us to take Islamophobia seriously. The discrimination documented by ENAR’s report is only a symptom of a deeper malaise that is attacking the very roots of Europe’s democracy. Hate and intolerance are becoming the currency of political discourse, used by governments to distract from their inability to offer social mobility and economic opportunity to a new generation. Adopting the illiberal discourse of extreme and far right movements only serves to strengthen their appeal. It is time for European governments to assert their commitment to the fundamental principles of democracy, human rights and equality – principles that were adopted precisely to ensure Europe would overcome the horrors of conflict and genocide. It is time we listened to the voices of the victims, and not to those who seek to draw Europe back into the grip of a not-too-distant intolerant past. 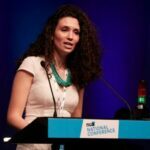 – Intissar Kherigi is a Tunisian-British researcher and PhD student at Sciences Po Paris in Comparative Political Sociology. She holds a BA in Law from Kings College, Cambridge University and a Masters in Human Rights from the London School of Economics and Political Science. She is a qualified solicitor and has worked in the UK House of Lords, the United Nations and the European Parliament.